McLemore is in custody and in the process of being booked. This after an acquaintance dropped him off at the jail. Franklin Police and Crime Stoppers are offering a cash reward for information that leads to the whereabouts of 57-year-old Reginald McLemore. The convicted felon is wanted for repeatedly slashing a Franklin woman outside a Cedar Drive home at 7:40 Tuesday night. The victim suffered lacerations to her face and body. Luckily, the injuries were not life-threatening. This was not a random attack, as McLemore and the victim are known to one another. McLemore fled the scene following the assault and remains at-large. He is wanted for Aggravated Assault. McLemore has ties to Franklin and Antioch. A cash reward of up to $1,000 is being offered for information that helps lead to McLemore’s capture. 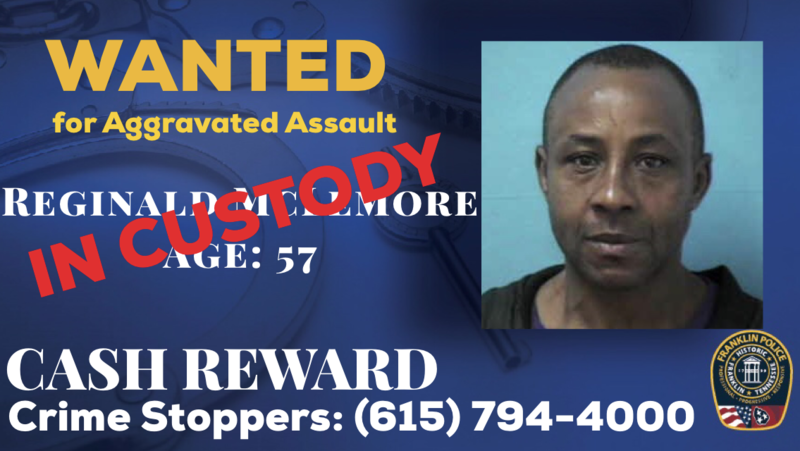 Know where Reginald McLemore is?